Although many knew Hobby McCall and Paul Horton personally and can tell you many great tales, very little is known about their father, and our law firm’s founder, John D. McCall. Below is information that has been compiled from firm records, federal and state census records, Texas marriage and death records, bar and university directories, and other sources. The McCall family descended from Scotland, migrating to Pennsylvania in 1730. Three generations of McCalls fought with the Colonial Army during the American Revolution and were rewarded with large land grants in what later became Screven County, Georgia, where they moved in 1785 to farm tobacco. Following the era of Reconstruction, John Francis McCall, his parents, his wife, Evaline, and their eight children left Georgia and moved to Willis, Texas to experiment with tobacco farming. Among those eight children was Screven Aaron McCall, who was born in Lowndes County, Georgia on January 25, 1861 and was educated in the public schools of Valdosta, Georgia. He received his legal degree from the University of Georgia in 1885 and was admitted to the Georgia Bar that same year. In 1885, he moved to Willis, Texas to become the first lawyer to practice in that town. In 1891, he married Florence Arnold Dean, of Magnolia, Texas, in Montgomery, Texas and they had one son, John Dean (John D.) McCall. Judge McCall served as the District Attorney for the 9th Judicial District of Texas from 1899 to 1906 and then served as the County Judge of Montgomery County, Texas from 1906 until 1912. 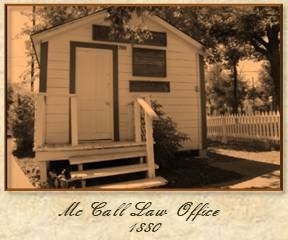 The McCall Law Office (14272 Liberty St.) still resides in the historic district of Montgomery and was donated to the Montgomery Historical Society by his grandson, Hobby McCall, in 1990. The building now serves as the Nat Hart Davis Pioneer Complex and Museum, where candlelight tours are given at Christmastime. A residential street and subdivision in Conroe bear his name. On August 1, 1914 Screven entered into a partnership agreement with his son, John D. McCall, and attorney Samuel Austin Crawford, creating the law firm “McCall, Crawford & McCall,” whose primary office was located in Conroe. The trio had a general practice and handled cases such as civil lawsuits, criminal defense, election contests, and divorces. Following John D.’s departure in 1919, Screven continued to practice law with Samuel Crawford until the end of 1928, after which both men were elected as District Judges in Montgomery County. The 1928 election of Judge McCall led to litigation before both the Court of Civil Appeals and the Commission of Appeals in State ex rel. McCall v. Manry et al. (118 Tex. 449), in which Judge McCall was represented in part by his son, John D. McCall. Judge McCall passed away on May 4, 1942 at the age of 81. Many of the ancient law books in our firm library have his name inscribed upon their spine. On October 4, 1913, Judge McCall helped found the Montgomery County Automobile and Good Roads Association and served as its first Vice President. On March 4, 1921, Judge McCall was the first to break ground on the new Conroe Baptist Church. In 1924, Judge McCall was selected as the alternate delegate from the 7th Texas district to the Democratic National Convention. ©2019 McCall, Parkhurst & Horton L.L.P. ALL RIGHTS RESERVED.